This past month saw the 13th annual running of the Ultra-Trail du Mont-Blanc (UTMB) trail race, arguably the most famous trail race in the world. The race course wends its way for 166 kilometers around the Mont Blanc massif, from Chamonix, France, into Italy, Switzerland, and finally returning to Chamonix. For many runners, the UTMB is the pinnacle of their trail running career— 40 hours (or more!) for which they’ve trained for years. Few run the race more than once. Another year, in progress! Philippe (on left) en route during this year’s UTMB. What’s it like to find yourself at the starting line at Chamonix’s Place du Triangle de l’Amité every year? Run the Alps’ Doug Mayer and friend Yitka Winn recently joined Philippe for coffee in Chamonix, just days before this year’s running of the UTMB. Here’s our discussion. Run the Alps: We had no idea that someone had run every UTMB! Philippe: I was told there were four people who’ve started every edition of the UTMB–and a few of them have even managed to finish every year. Run the Alps: How did it happen? Philippe: I took part in the first edition, and then I just found myself trying it again, every year. At first, this was because I didn’t finish my first three attempts, so I was eager to finish a UTMB. Then, after that, it was because I felt my time was not good. It’s still not good! I wanted to have a better time, so I kept trying again. Run the Alps: Tell us about the first UTMB. What was it like? Philippe: Before the UTMB, there was a multi-day stage race around Mont Blanc. It was out of these origins that the idea of a continuous race developed. That first year of the UTMB, it was raining. It was also the only year when we left Chamonix in the morning. The fact is, the race organizers didn’t really know how long it would take for one person to run around Mont Blanc. A maximum time limit of 38 hours was established. For that first edition, the race was 153 km, a bit shorter than it is today. There was an option to stop in Courmayeur, Italy. But it was made clear to us that if you chose to go on, you were supposed to finish. So, a lot of people decided before they started, that they would probably stop in Courmayeur. Training with a view. Philippe trail running in the Chamonix valley with Antoine Tavernier and President of Chamonix’s trail running club, CMBM, Federico Gilardi. Run the Alps: So, how did that first year go for you? Philippe: The weather was bad, so when we got to Courmayeur the race organizers said, “We think it’s better if you stop,” but I wanted to try! So I left the village, but I didn’t go far. I walked about 16 km to Refuge Elena, at the base of Col Grand Ferret. Unfortunately, I have no ranking for this edition of the race, because I gave up in between stopping points. There were 750 racers at the start. Only 67 people finished. But the mythology of that first race is that less than 10 percent finished, which is true in a sense. But, most of the runners had already planned on stopping at Courmayeur. And, of course, the weather was bad. Run the Alps: So, you came back for a second year…. and a third… and a fourth… and on for more than a decade. Why? Philippe: It’s funny when I think of it now, in 2003 when the race began, I was 40. That was 13 years ago, now. Last year, I nearly gave up. It takes me about 40 hours to run the race, and the second night is always very challenging without sleep. These days, I don’t have the same feeling about the race. In the beginning, I was involved in preparation. But now, I arrive without preparation. I just do it! My life has changed in every way since that first edition, but there is this rendezvous, this special time of year for me, during the UTMB. I like this idea of trying to do this as long as I can. Run the Alps: Are there specific moments that are particularly memorable? Philippe: My first finish was a great moment! It was my fourth attempt. I had an knee injury and a doctor in Champex, said, “Maybe you shouldn’t go on from here.” I said “Look, I already stopped each of the last three years. I would like to try!” And so, I tried. I was exhausted, but I made it. I was very happy! Run the Alps: We have to let readers know, there was one year you didn’t run the UTMB! Philippe, all smiles, after the 2013 finish of the UTMB. Run the Alps: What keeps you coming back? Philippe: People in sports, and trail running in particular, I know are very friendly. They’re easy to speak with. I know Dawa very well. (Editor’s note: Dawa Sherpa was the men’s winner of the inaugural UTMB.) I’ve met Kilian Jornet a number of times. It’s a community. And, of course, the concept of running around Mont Blanc is simply fantastic. When you’re at the Col du Bonhomme during the night with a full moon, it’s fantastic. 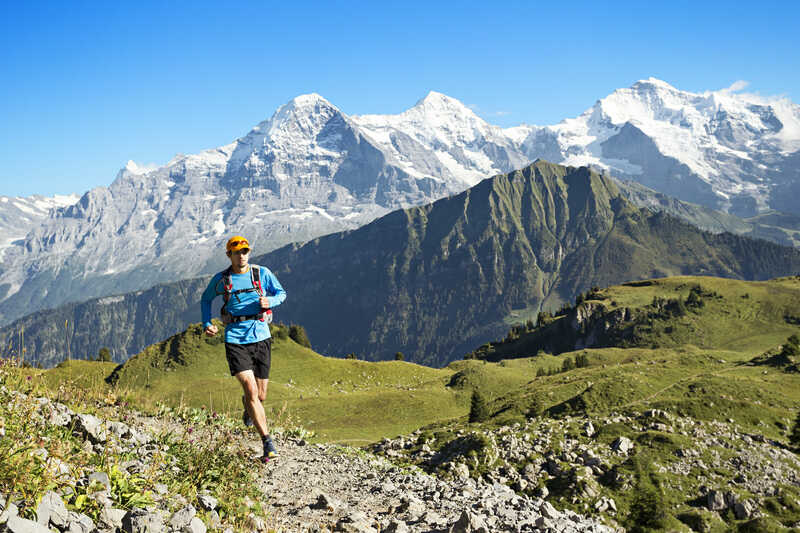 Run the Alps: How do you prepare each year? Philippe: I run a number of trail races during the season. I’m also into climbing, mainly rock. Run the Alps: What’s next for you, Philippe? Philippe: We’ll see! This year, I am running less. I’m starting to feel my knee. Run the Alps: When do you think you’ll stop running UTMB? Philippe: Every year, I say I’ll stop running it, each time I finish. But the day after is different! I have to admit, I think I’m not made for this kind of distance. It takes me too much time. I think a distance of around 110 km is better for me, or about 24 hours. I really need to sleep. I’m 52 now, so sometimes I say, “Okay, this is the last time!” But, we’ll see! Editor’s note: Philippe finished the 2015 edition of the UTMB, in good form, with a time of 42:02:02, good for 946 of 2,000 starters. We wish him many more great finishes!